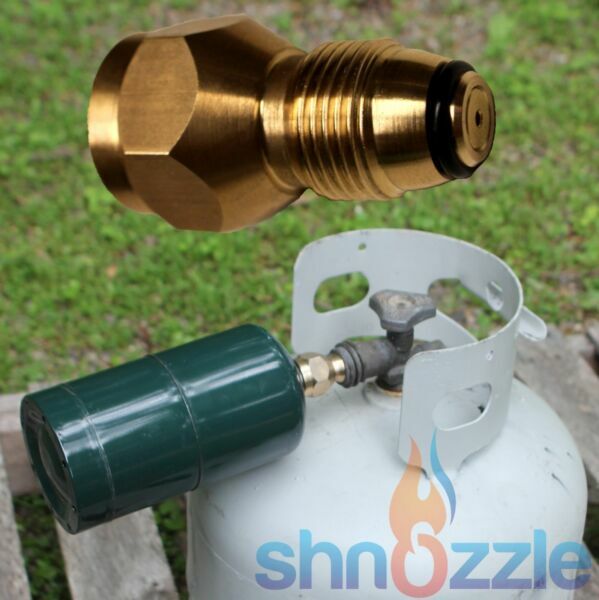 eBay 100% AuthenticThis is a HEAVY DUTY 100% Solid Brass Propane adapter It will SAVE you Money! and it could SAVE YOUR LIFE!! it allows you to refill small disposable propane tanks with your larger 20-50LB BBQ propane tank. This amazing product will allow you to save so much money.and it could SAVE YOUR LIFE. The link to our instructional Video will be included!This listing is for 1 Brand New Shnozzle Propane Refill Adapter which is used to refill 1 LB and other smaller propane tanks / cylinders.Cheap Knock-offs can be taken apart by hand and are typically steel with brass plating. Ours is SOLID BRASS and built to last forever.100% Authentic over 50,000 soldTo use Shnozzle to Refill 1 LB. Cylinders from 20-40 LB. Tank Important: Always start with an EMPTY cylinder. Before refilling, chill the smaller empty 1 LB. cylinder for 15-20 minutes in the fridge (for best fill). Have full larger tank at room temperature (never exceed 85°F). See WARNING Connect left-hand threaded lug of adapter to tank (use wrench – see illustration #1) Connect right-hand threaded cap of adapter to 1 LB. cylinder (hand tighten) Turn 1 LB. cylinder and tank upside down (see illustration #2) Open valve on tank for several minutes until you can no longer hear the propane transfer. Then shut valve off. Return 1 LB. cylinder and tank to upright position. Disconnect smaller 1 LB. cylinder FIRST. Inspect 1 LB. cylinder for leaks: Place a small amount of ½ liquid soap ½ water solution on cylinder opening and on relief valve. If bubbles appear, discard smaller cylinder in a safe area. Shnozzle is a great product that Pays for itself after only several uses!If you have any questions at all, please ask freely!